Now that is a lot of cement! Here are just some of the supplies. Here the posts are being layed out. 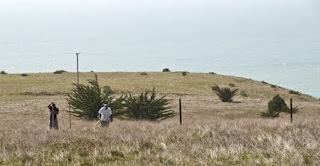 The sticks are markers for where the posts are going. So we are well under way. For those of you who live in the Point Arena Area, there is a Flower Power celebration in town this week-end. The local no name gallery, which is between the Redwood Credit Union and the purple house (has a flower power sign on front of the building) will have a show of local artists and I will be there selling pinto photographs, pinto cards, and the last of the pinto 2010 calendars. The hours are Friday 5:00-7:00pm; Saturday and Sunday 12:00-4:00pm. Hope to see you there! I am now the proud owner, actually I don't like that word, the new guardian of the 7 wild pintos! 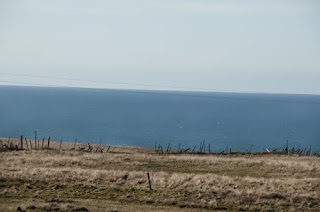 My neighbor where the horses lived, had to sell his land and his only choices for the pintos was to find them a new home right away or they would have had to go to auction. 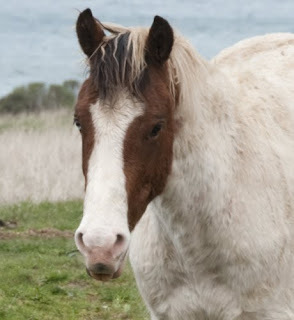 Since the horses basically adopted me about a year ago (see older posts below), there was no way I was going to let them go to auction or leave this area. 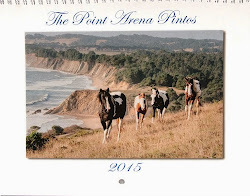 They have become the local celebrities of Point Arena and I am touched by how many people care about these lovely animals. As you can see from the above photo, the fence line is down between the two properties and we don't have any fencing on our property, so we need to build a fence to keep them safe from wandering around the neighborhood or getting onto the highway. I will be posting pictures of the fence as it is being built. Presently, I never know when the horses will come over from the other side of the fence. Sometimes every day and sometimes not for several days. 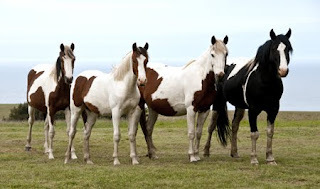 While we were in the middle of the paper work transferring the horses to me, they showed up! It is as if they knew! Several local people have offered financial help and have given suggestions, for which the pintos and I are very grateful. It is a large project and if there is anyone else who wishes to make a donation please email me at pa@photographycreated.com . Any amount is appreciated and because we are not a foundation, your donations will not be tax decutible. 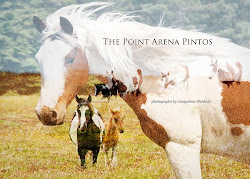 You can also purchase pinto cards at my website http://www.photographycreated.com/ the profits from these cards goes towards the pintos care. 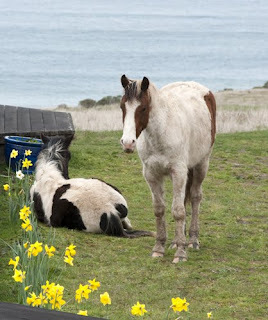 Suki and Little One decided to rest by the daffodils a few days ago. This is a blow-up of Little One from the same photo. I love the way his tongue is slightly sticking out!